Those words were spoken to me many moons ago by my CW, QRP and outdoor radio sensei Jim Cluett, W1PID. He wasn’t talking about the Zombie Shuffle, a fun low-intensity contest that’s held each year on the Friday night that’s closest to Halloween. This year the shuffle was on Halloween Eve, a perfect dark evening to have some great fun. Jim’s advice about courage had to do with getting on the air and wandering into the jungle of invisible radio waves as a CW beginner. Believe me, it can be a scary place. But last night, I was brave. Unbeknownst to me over the past two weeks I had reached yet another plateau on my long and arduous CW journey. I was about to discover I finally had listening skills that would allow me to have the most fun yet on the air. And fun I had! Last year I signed up for the Shuffle and was lucky enough to garner a very special number. Zombie numbers are given for life. The two ghouls behind the Zombie Shuffle are Paul and Jan Harden, NA5N and N0QT. They refer to themselves as the Grand Zombie Grand Witchess and Contest Coroner. I want to thank both for creating a special memory for me. Prior to last night the most QSOs I’d ever done on one day was three, maybe four. In just over two hours last night I’d do thirteen. Yeah, if you’re an experienced pro, you can do 100 or more Qs in two hours, but years ago you were where I was last night. You didn’t start out doing CW at 30 WPM. The shuffle is a fun contest. It’s not meant to be a high-speed adrenaline-filled sprint or like the madness of Field Day. That’s the philosophy of the contest taken right from the Zombie Shuffle website. I was sending at 12 WPM with a spacing of probably 10 WPM. Everyone who I worked slowed for me and I was able to copy 98 percent of everything sent. I was euphoric. Moments before sundown last night, that’s when the contest starts no matter where you live, Jim called me. What was he thinking? Well, when viewed from his perspective I’ve not been putting in the requisite time to become a skilled operator. But Jim doesn’t know me that well. When I decide to do something, I do it. The issue with CW is that I’m still a working stiff and a few other things have nudged me away from the key. I hung up the phone and rushed up to the shack. Quickly I reviewed the frequencies, made a crude logbook in my notebook and turned on the radio. I started out at 40 meters because I thought that would be alive at this time of day / pre-night. I wasn’t disappointed. I went to 7.030.30 and started to call CQ. Because I’m a rookie contest grasshopper, I did my CQ wrong. Oh well, the pros knew what was going on and were gentle with me. Within a few minutes N8RVE came back. BOOM! 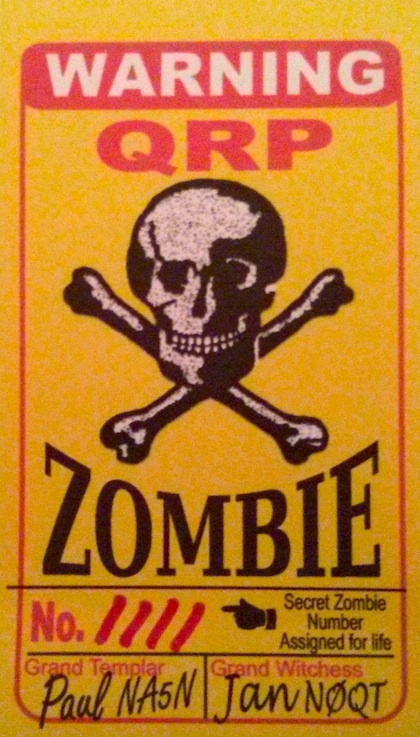 I had my first Zombie QSO. Then another, and another and another. I can’t remember if Jim texted me or called me, but over the next hour I’d text him at least five or six times and we’d talk on the phone a few times. I was so excited I was telling him what was happening. Early in the contest I had five or six QSOs to his one! Hah! We eventually worked each other on both 80 and 40 meters. You’re allowed to work the same station more than once so long as you’re on different bands. Time passed quickly. Before I knew it I had been on the air for over two hours with just a 10-minute break for dinner. Jim knew I’d love to work an Elvis in the shuffle. Elvis and Elvira stations are operators who you can work to get 666 extra points. Jim found WA5TCZ on 20 meters and texted me. After several attempts, he finally heard me and was extremely patient as I was battling lots of fading – QSB. By 8:30 pm I was tired. What’s more, my body chemistry was changing as the adrenaline that powered me two hours before was being neutralized in my veins. It didn’t matter. I had a grin on my face as big as any carved pumpkin in central New Hampshire. It was a night I’ll never forget and there’s lots to be said about being brave. 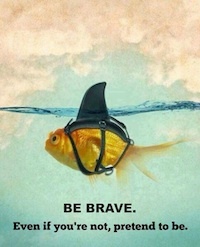 You can be brave too. 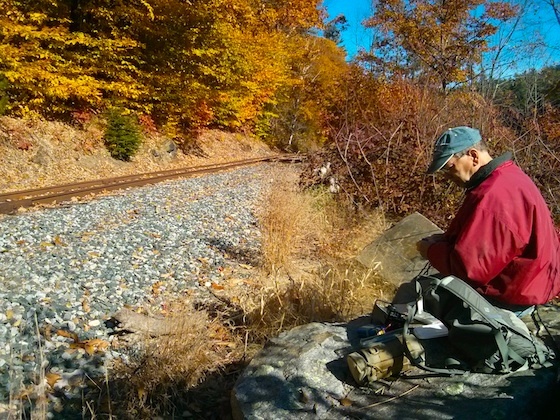 Jim Cluett, W1PID, and I went to the jaw-dropping Livermore Falls today. It was a bright cloud-free day and even though we’re just days away from November, there was still lots of color on the trees. Fall came late this year because of a very warm September. Here’s what I was looking at just after leaving my driveway. It was going to be a splendid day! We met to go to the falls after I left my truck to get serviced at a local Ford dealership. Jim and I had at least two hours to play radio and get some lunch. We ended up stretching it to three hours as it was such a gorgeous day. As we walked down the dirt path to the falls, we could hear the roar of the water. This is the Pemigewasset River just before it dives down the falls. You can see the first step in the falls in the lower right corner. 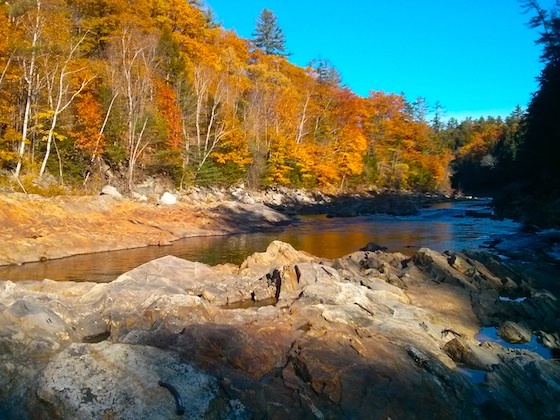 The Pemigewasset River cuts across some very hard metamorphic rock that’s been polished and rounded by countless gallons of water over thousands of years. I couldn’t resist shooting this video of the rushing water. Although Jim and I have been here at least two other times, this was the first time I had wandered down to the water’s edge. 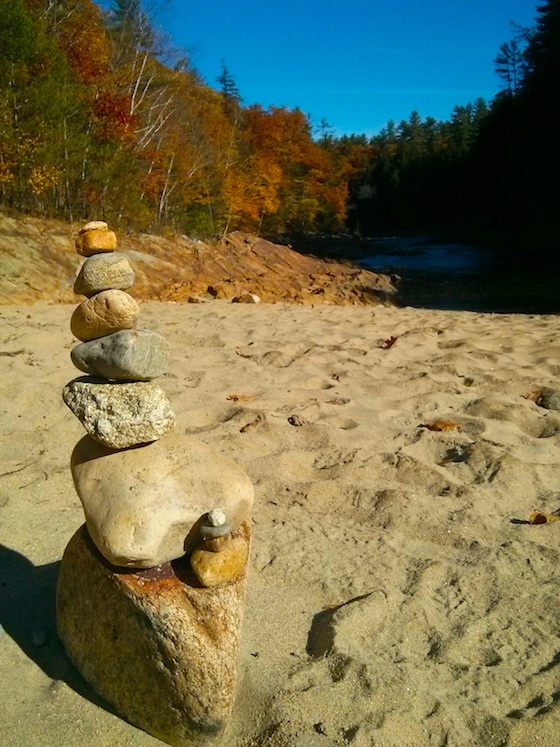 There’s a giant sand bar on the west side of the river and someone had stacked a few stone cairns. This cairn was about 18 inches tall. I wonder how long it will stand? It was peaceful down by the river. 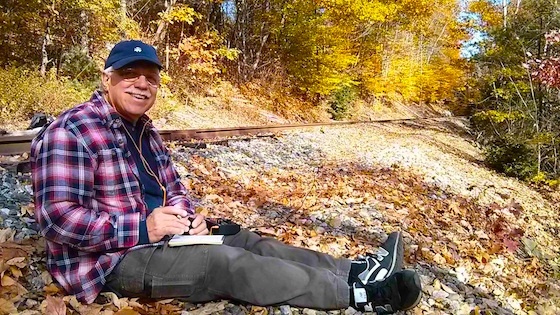 As I was admiring the falls and soaking up being next to the roaring water, Jim was busy setting up next to some railroad tracks above the river. Jim’s a pro. He found a perfect spot in the sun with a nice flat rock to use as an outdoor ham shack. 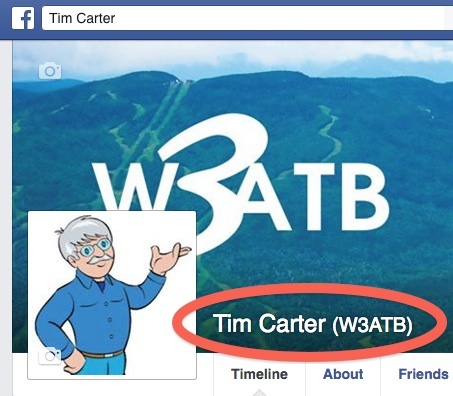 He’s my outdoor QRP radio sensei and he’s a pro at working as many bands as possible in a short amount of time. Today would turn out to be one of his best days ever with respect to other operators able to hear his signal. Propagation was superb and he was racking up the QSOs. Here he is working his first contact. Years ago Jim was a TV news producer and helped create lots of news video, but as you’ll soon see, he doesn’t like to be on the other side of the lens. I After shooting the above video, I wandered north up the railroad track about 150 feet and set up. I’ve got a dandy HB-1B and was only able to work 20 and 40 meters. Twenty meters was quite active, but for some reason many of the stations I could hear well, they couldn’t hear me. Jim thought it was my piece-of-crap 3-foot BNC cable that connects my radio to my par-EndFedz antenna. I was trying to hunt and pounce and all of a sudden I heard a station BOOMING into me. It was Ian from England – G4MLW. He was going much faster than I could copy, but I got part of his call sign the first time. He came right back to me giving me a 559 signal report and I clearly copied his name. I responded with a 599 as his signal was so strong it was as I was sitting next to him in his shack. I asked him to repeat his call sign and he did. By that time Jim had wandered up the track and took one of my ear buds. He was able to hear, with ease, Ian’s call sign. I barely avoided the skunk, but the glorious WX made up for my dismal performance. Winter is just around the corner and you can probably count on one hand the number of great days like today that we might get out to do more outdoor radio. 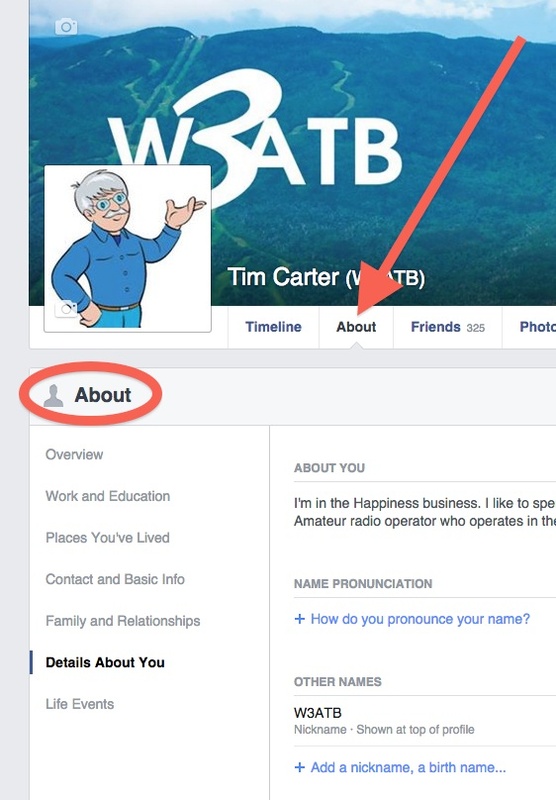 Here are the easy steps, as of October 2015, to add a ham radio call sign as part of your name at the very top of your Facebook page. See my call sign just after my name? Both are in the red oval. Facebook calls what you see between the ( ) a nickname. They also call it all sorts of other things in a drop-down list. For example, you may want your maiden name to appear after your name. Here’s how to get your call sign to show up. Go to your primary account page and click the About text link. Once you’re at that page, in the left column select the phrase: Details About You. See it just above in that screenshot? When you click it, you’ll see what you see above. 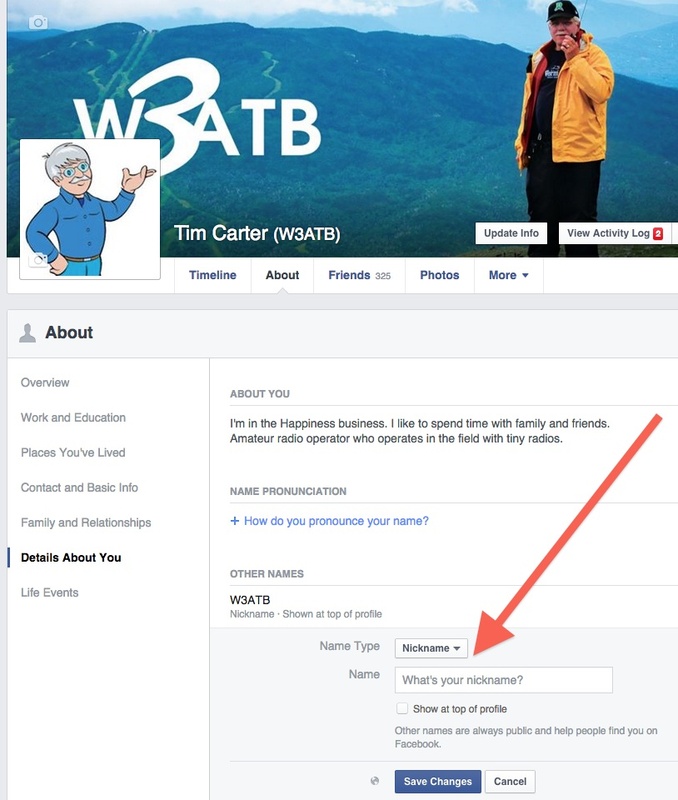 Look at the lower right corner where the blue + is and it says: Add a nickname, a birth name …..
See the drop-down list box right to the left of the red arrow tip? Make sure it says “Nickname“. Type in your call sign in the box just below where you now see “What’s your nickname?”. Click the SAVE CHANGES blue rectangle and get back on the air and make a few QSOs. IMPORTANT AUTHOR’S NOTE: Please be aware that Facebook is constantly changing their interface and rules. You MAY have to do a few things differently to get the same result I did. I can’t keep coming back here to adjust my instructions to match their whims at any given time. TNX as we say in Morse. The Beginners Guide can be found after the following story. I encourage you to read the story first and look at the photos before reading the Beginners Guide. The Beginners Guide was last revised on October 22, 2017. 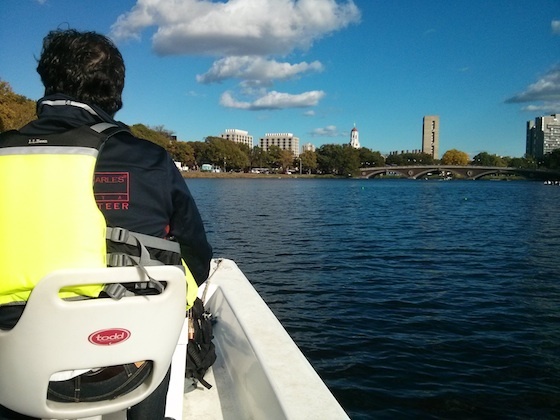 The Head of the Charles Regatta is a world-class public service event for any amateur radio operator. It all started in 1965 and it’s held in Boston, MA every October. 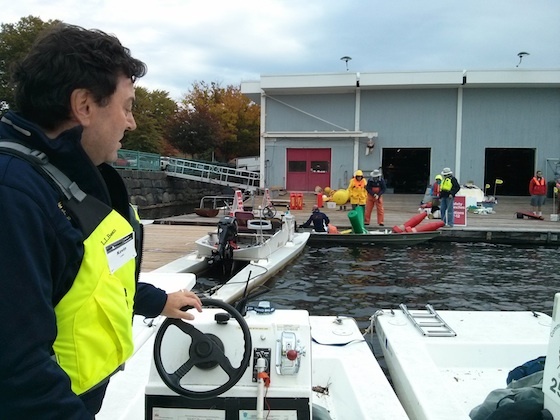 I’ve worked quite a few public service events, including the Boston Marathon and if you’re an amateur operator that wants to challenge your skills, the Head of the Charles is one you don’t want to miss. Yesterday, October 16, 2015, I worked the regatta for the first time. 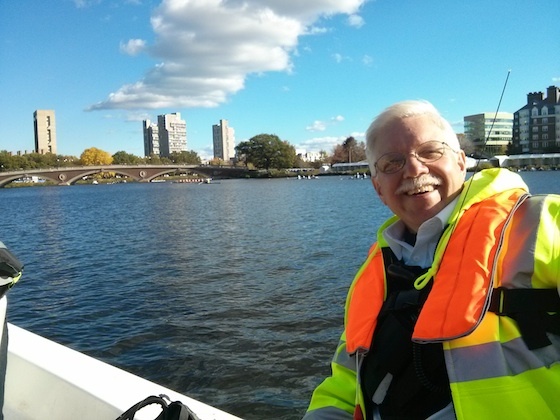 I was out on the wind-swept water of the Charles River in an odd open fiberglass pontoon boat as part of a three-man team. My tactical call sign was Safety Launch 3. Amateur radio operators provide critical communications during the event in case crew members tumble into the cold waters of the Charles River and need to be rescued. I’ll share my story of the day’s events and then I’ll provide you with invaluable tips that I wish I had known about prior to arriving in Boston. While the competition is a two-day event, the hundreds of teams from around the USA and the world practice on the Friday before the event turning it into a three-day event for the hundreds of volunteers like me. I decided to only work the practice day to get my feet wet. I’m glad I did because all volunteers need to be present for 6:00 AM meetings at the various boathouses dotting the shoreline of the infamous Charles River on the two competition days. On the Friday practice day, that arrival time is pushed back to 8:30 AM. I decided that I’d leave my central New Hampshire home at 5:30 AM so I’d arrive in Boston just after 7:30 AM. It’s only a one hour and fifty-minute drive so I thought I’d pad in some time for rush hour. Since I rarely drive into Boston on a work day morning, I discovered that the commuters must leave their homes at 4:00 AM to try to avoid the snarled roadways that feed into the metropolis. Stressed out after three, not two, hours of fighting stop-and-go traffic I pulled into an empty parking spot at the MIT boathouse in the famous Basin of the Charles River. This is the correct boathouse to meet at. Note it’s on the upstream side of the bridge. There’s another boathouse on the downstream side of the bridge. I’m hoping my Beginners Guide inspires the event organizers to make better use of satellite images and custom Google maps that have exact icons showing exactly where certain positions are on the course. Look below at a sample of a custom map I created for the Finish Line area complete with photos of what you’ll see when you stand in the location of one of the custom icons. It’s just upriver from the Route 2A bridge that spans the waterway soon to be clogged with hundreds and hundreds of the sleek sculls. I discovered I had to move my truck to a parking lot about a half mile away, but that had to wait until after the brief organizational meeting down next to the dock in the boathouse. The boathouse was clogged with volunteers of all sorts getting other volunteers checked in. Safety launch boats and other launches were being readied for the day. Many of the launches were manned by women and men who’s job it was to try to keep the sculls from crashing into one another along the three-mile section of the Charles River where the regatta takes place. As the day progressed I discovered these other launches would be anchored near bridges and tight turns in the river. Using megaphones the workers would alert the crews and coxswain about impending danger. 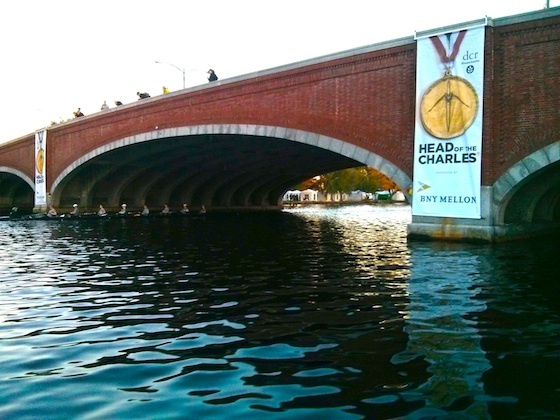 Visibility at the arched bridges that span the Charles can be limited as late in the day an eight-person scull nearly crashed into the launch I was in as we both entered, from different directions, a bridge archway. The weather forecast for Boston yesterday was spot on. It was cloudy and windy in the morning. The air temperature was in the mid 50’s F, but there was a stiff 15 mph wind whipping across the water from the west. It felt much much colder than it was. A passing light rain shower happened just before 9 am and I was fretting being out in the rain all day. As the morning passed, the sun made a welcome appearance and it was quite sunny until sunset. The wind didn’t let up all day although it was much stronger in the morning than the afternoon. The weather almanac shows it reached 61 F in the afternoon, but I was wearing long underwear and four layers of clothes on my body core and was just barely warm enough. You can’t bring too many clothes to this event. 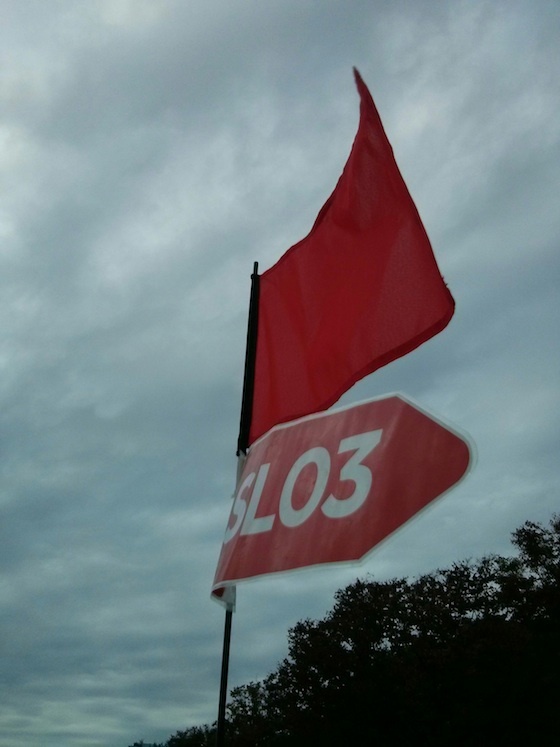 Each safety launch is assigned a section of the regatta course to patrol. 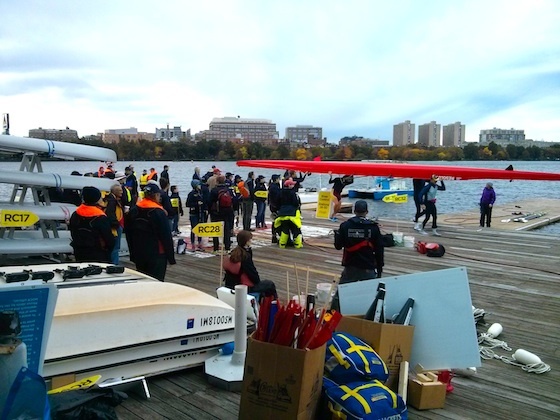 There were only five safety launches out on practice day, but on Saturday and Sunday there are usually no less than ten or more of the funny open pontoon boats scattered on the Charles River. Our captain, Kevin, was an experienced pilot and this was his third year working the event. We kept to the Cambridge (north) side of the river and hugged the shore because some lane buoys were often just 100 feet, or less, from the shoreline. We spent the day motoring at no-wake speed going up and down the river always scanning the rowers looking for someone who was in trouble. Fortunately no one ended up in the water all day. That’s what we, as volunteers, want. No medical emergencies were reported all day. That’s also a good thing. The radio operators in charge of the event set up three different frequencies to handle the radio traffic. Two of them utilized local repeaters and the third frequency was a local simplex radio-to-radio frequency. Signal propagation can change from day to day and hour to hour. We discovered that the Bravo – or secondary repeater – produced a much better clarity so all of us switched to it by Noon. I was equipped with two Yaesu VX-7R hand-held radios. Both had the three frequencies pre-programmed into the memory. That makes it easier to switch from one of the three frequencies we were using. It’s hard to describe what it’s like being on the water and watching the sculls go faster than the launch. The crews vacate the river after the sun sets. Each safety launch is released from duty once their section of the river is clear of the sculls. 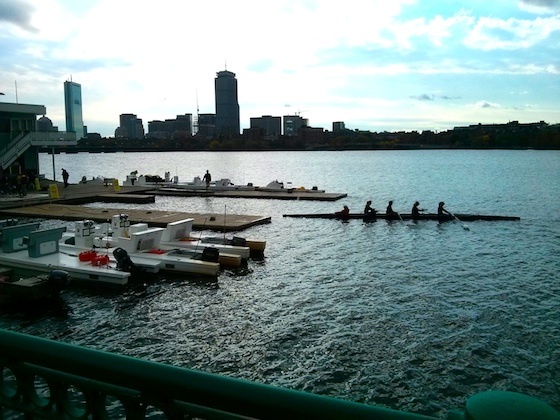 We pulled into the dock at the MIT boathouse as twilight was deepening. I turned in my life preserver and Kevin and I walked the half mile back the parking lot where we could saddle up and head home. 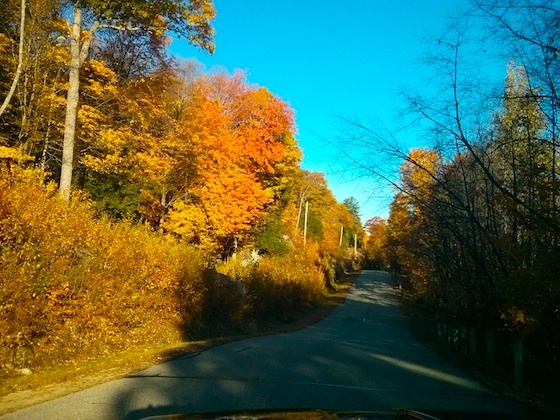 He had a two-hour drive back to CT and I was headed north up I-93 to central New Hampshire. I thoroughly enjoyed my day at the event and will be back next year. If you’re an amateur radio operator, I encourage you to volunteer. You’ll be a better person in many respects if you do, and you’ll get a handsome jacket or down vest and hat for your efforts. If you’ve never worked the Head of the Charles (HOC) Regatta as a ham radio operator, the following should help you. IMPORTANT BEGINNER TIP: If you’re a new ham operator and have never worked a public service event the scope of the Head of the Charles, by all means request to be paired up for the day with a seasoned operator. There’s NO SHAME in doing this. It will relieve your anxiety and it may save someone’s life if you were to panic in an emergency situation while alone. I’ve seen it happen. The walking teams include a ham operator and first aid volunteers to offer assistance should a scull capsize near a shoreline. They can provide initial care and call for more help if a paramedic is needed. Here’s a sample map I made to show a few of the radio communications positions. The giant parking lot you’ll see in gray is filled with countless sculls and their trailers. Click the tiny arrow box in the upper left corner of the below map to see the slide-out legend that explains what each of the colored icons represents. Click a few of the icons to see actual photos of what it looks like when standing at that position. CLICK HERE to see the actual map with it’s legend explaining what each of the colored icons above represents. Parking in Boston and Cambridge can be a challenge. The universities seem to provide parking passes for a few parking lots near key meeting locations. I was able to park in an approved lot about 1/3 of a mile from the MIT boathouse. It was a short walk and quite safe. Parking for any assignment near the Finish Line is available at some businesses along Western Ave just a short walk from the giant finish-line area where the crews store their sculls. You have to pay for these spots. I paid $30 to park in 2017. It was well worth it knowing that I would not get towed from a public street-parking location. If you decide to park on any street, pay very close attention to the signage and times parking is permitted. My guess is it might cost you $250 or more to get your car back if it gets towed. I parked at the Skating Club of Boston on Western Avenue when I worked at the Finish Line in 2017. There’s a convenient foot bride at the western edge of the parking lot that allows you to cross over Soldiers Field Road safely. Here’s a handy Google Maps satellite image of part of the Finish Line area. The magenta arrow points to where I parked my car at the Skating Club of Boston. You enter the lot off Western Avenue. 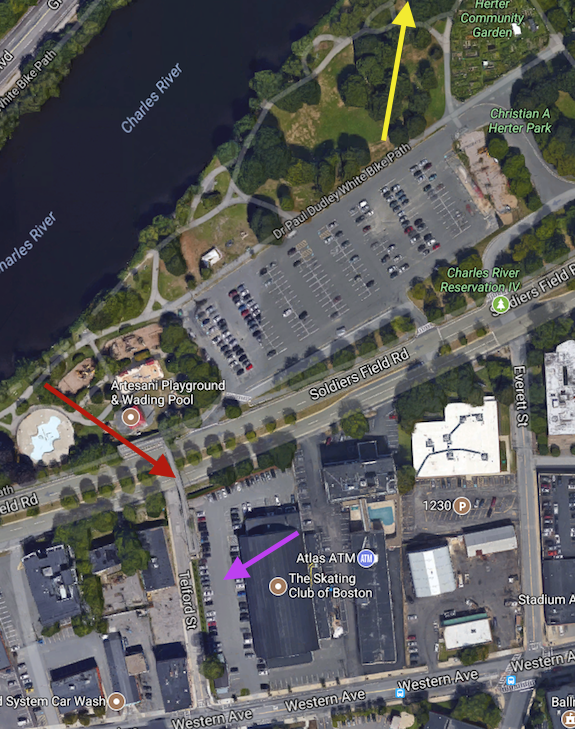 The red arrow points to the foot bridge that crosses Soldiers Field Road and dumps you into the giant gray parking lot. 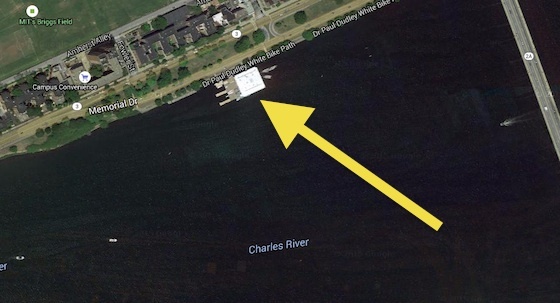 The yellow arrow points to the trailer and Red Cross area that makes up the Finish Line. On race weekend that giant parking lot and all the grass area in the park next to the river is filled with hundreds of sculls. Copyright 2017, Google, Inc. The ramp dumps you out in the southwest corner of the massive parking lot where all the sculls are stored on trailers. Walk across to the northeast corner of the parking lot to get to the Finish Line. If you work on the Saturday and Sunday you should never have an issue getting into Boston at 5:30 AM to make your 6 AM meeting time. If you work the Friday practice day as I did, plan for SEVERE traffic congestion within a 10-mile radius of the regatta course. It took me an hour to go the last ten miles of my journey. Take extra time before the event to acquaint yourself with the exact location of the parking lots and how to navigate the dreadful one-way roads in Cambridge and Boston. Add in enough time to walk from the parking lots to your assigned meeting place. Don’t trust Google Maps to provide you with the correct location for any names and/or addresses of the places the ham organizers tell you to be at for morning meetings. Google Maps sent me to the wrong MIT boathouse down river from the correct one. Request from the communication team leaders satellite maps from Google Maps like the one below that has an annotation oval or arrow showing you the exact meeting places / parking lots / etc. I’m told past regattas have ranged from hot to snow, sleet and driving rain. Only a tiny handful of radio operators would be under any sort of cover for the day. If you’re out on the regatta course, you’ll have NO COVER. The safety launch boats are wide open like a row boat. If it’s raining, plan that you’ll be out in the rain all day. If you get wet and cold, you’ll be useless to the crews in the sculls. Wind is an issue. It cuts like a knife coming across the water. Whatever clothes you bring must fit in a backpack you can carry all day. Store extra clothes in waterproof bags inside the back pack. There’s plenty of room on the safety launches for large backpacks or even a duffle bag if that’s what you want to carry. Lunch is provided by the HOC event organizers. It was delivered to those of us who were out on the water. I suspect the same held true for all the other land assignments. However, you may get it at 11 am or at 2:30 pm. Bring your own food for the day just in case. Bagels and doughnuts were provided at some of the early-morning meetings. I took two extra bagels and put them in my backpack. I was glad to have them as I had eaten breakfast at 5 AM. They made for a great mid-morning snack. There may not be a morning meeting at all if you’re assignment is onshore. You may find expensive vendor food and $4-per-cup coffee at any number of vendor tents. Hand-held radios work fine for this event. I brought two of my expensive Yaesu VX-7R radios on the safety launch. That was a risky gamble in case there was a catastrophic accident aboard my launch. It might have been smarter to bring two Baofeng $30 radios that could sleep with the fish at the bottom of the Charles River in the event I and the radios tumbled into the water. Losing a favorite high-performance HT overboard would not be a pleasant experience. I should have brought one of my Baofengs to see how well it performed. My guess is it would have had no trouble hitting the two repeaters. Test your radios as you walk from the parking lot to the morning meetings to ensure you have programmed in the correct frequencies and settings. BRING YOUR RADIO MANUALS or download a digital copies into your smart phone. If you’re on a safety launch, attach a flotation pillow or put some bubble wrap inside your backpack. You want it to float in case your backpack ends up in the Charles River. Be sure there’s a name tag on your back pack. Store your secondary radio in a sealed zip-lock freezer bag so it’s waterproof. Put some air in the bag to help your backpack float. Speaker microphones come in handy. Check your radio to ensure it’s not sending out the 1750 Hz burst tone. You need to know the names of the bridges if you’re on a safety launch. You need to know where you are if you’re on a walking team. You need to communicate which side of the river you are on. If unsure, say “upstream” or “downstream” side of the bridge you’re at. You need to know distances. How many feet or yards are you away from a bridge? Always be aware if you are up or down river from a certain bridge. You need to know what side of the Charles River you’re on, or the nearest shoreline. It will either be the Boston or Cambridge side. Boston is on the south side of the river. Cambridge is on the north side of the river. If you provide the wrong location for where the emergency is, precious moments could be lost that could make the difference between life and death for a crew member. Bring a great attitude with you and soak up the excitement, youth and vitality of the crews and the many sculls on the water at once. Remember always that the crews and event organizers are quite aware of your presence even if they don’t say a word to you. They appreciate your efforts to keep them SAFE. They realize you’re there to HELP them in the event something goes wrong. Don’t expect anyone to thank you, but if it happens it’s icing on the cake. Respect the operators at net control and keep the frequencies open at all times as you never know when a full-blown emergency can happen. If you have questions or if you’re a seasoned operator who’s worked this event, please ask questions in the comments below or provide MISSING INFORMATION or TIPS there. Thanks and enjoy yourself when you work this event in the future.